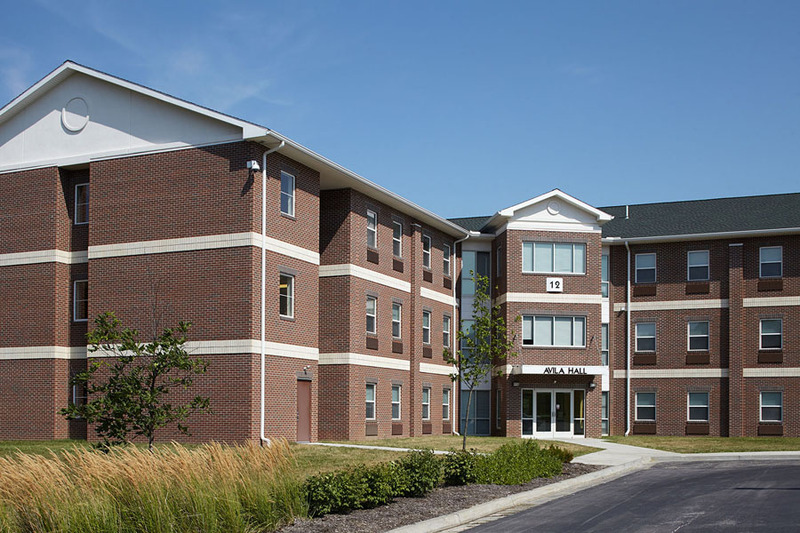 Situated on the northeastern edge of campus in one of the last remaining open spaces, the new Avila University Residence Hall is an “L” shaped, 37,000 SF building which borders a previously remote parking lot - increasing safety and security for students and their cars. The three-story, 21-suite all brick building houses 104 bedrooms. 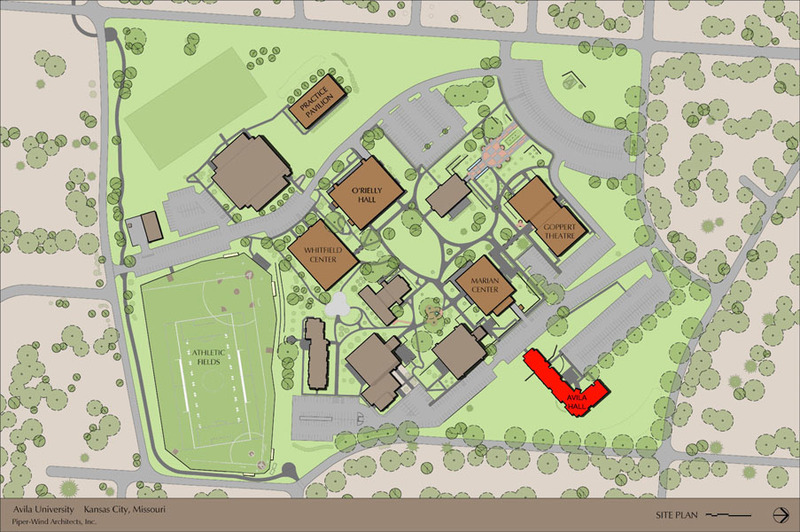 Built on a sloping site, the main entrance and common open space faces the parking lot while an upper level entrance at the building’s end provides level access to the campus circulation loop. A natural buffer between the building and the adjacent residential streets created a generous, park-like setting and space for a water feature amenity. The building configuration anticipates a future addition that will further enhance the relationship between the building and the site’s open space. The first floor includes a generous entry vestibule; lobby space with room for an information desk and flexible use space; alcoves; a large, sun-lit sunken living room with park-like views; a large, flexible office space; a meeting room; common laundry; mail facilities; a project room, and media room. 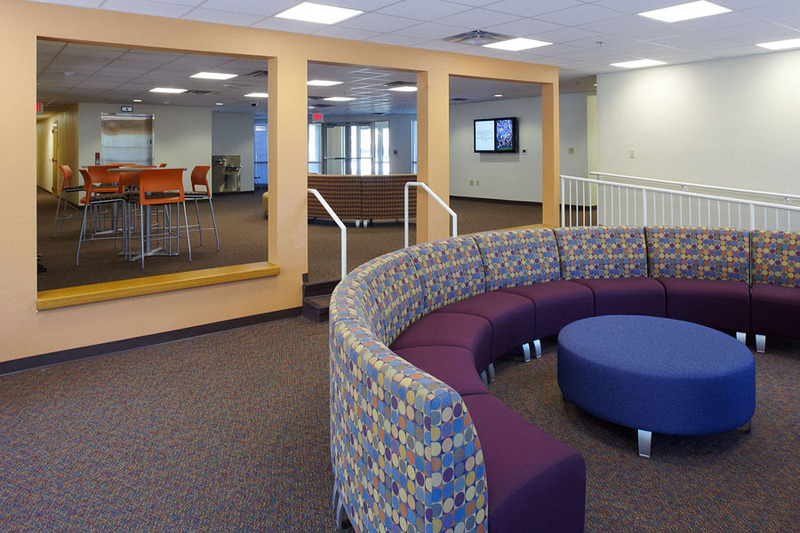 Both the second and third floors have generous, free-form, flexible use common areas adjacent to the central elevators; smaller seating pockets, and large bay-window alcoves for group meetings or study. 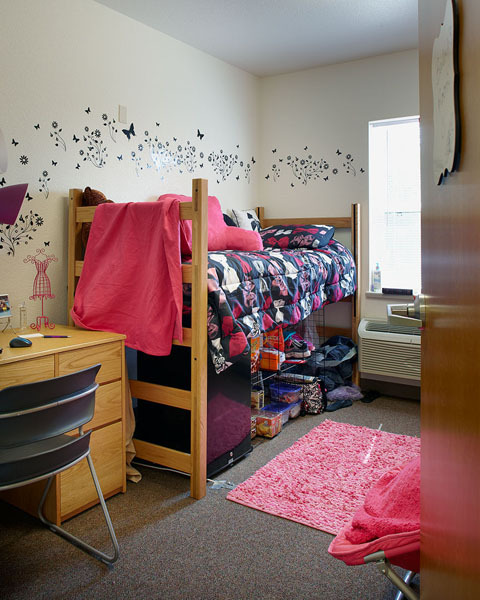 Through extensive dialogue, a new model emerged building on the philosophy of promoting campus community - bundling five bedrooms in one suite with a small common area and a single restroom which can accommodate up to seven people. The bedrooms contain a single bed or double-bunked beds with a desk and a closet for two. Private bathrooms are each equipped with a sink, generous counter space, showers and water closet (situated to allow for multiple use while maintaining privacy), flexible use storage shelving and a second counter area. Each suite’s central common area serves as a gathering space with soft lounge chairs, tables and/or desks allowing it to be used for study, socializing, eating or watching the wall-hung flat screen TV.